We awoke to cleared weather and decided that it would be safe to risk a walking tour! After a quick breakfast, we made our way to Dunkin’ Donuts in East Berlin, where we were to meet Stephanie, our New Zealand guide. Once we reached our destination, we met Francis, an extremely tall Canadian guy who was by himself, and so he tagged along with us on the walking tour. Just before we left our meeting point, Stephanie pointed out a bombed out church just behind where we were standing. Having been almost completely destroyed during the Second World War, it had been left as a memorial and reminder to the devastating events that World War Two had created. We followed Stephanie to the Brandenburg Gate, where we viewed our first piece of Berlin iconography. We were then met by Matt, who was to be our guide for the walking tour of Berlin. Surprisingly, the first piece of information that we were told regarding Berlin, was not the story behind the impressive architecture of The Brandenburg Gate, but that the hotel directly behind us was the site of the famous stunt by Michael Jackson, who had dangled baby ‘Blanket’ out of one of the upper windows! Throughout the duration of the tour, we were regularly shown the cobbled remains of where the Berlin Wall once stood, separating East and West Berlin. Our most significant stop at the beginning of the tour was at the Jewish Memorial, where 2711 tall grey blocks are stacked, covering a wide area. We were told that this memorial cost 27 million euros to make, and that the colour of the stones was to represent the colour of burnt bone. We were also informed that each and every stone block was sprayed with an anti-graffiti material, in order to avoid vandalism. We walked through the memorial, absorbing the strange feeling as the further you walked, the higher and more imposing the blocks became, making you feel smaller and smaller; perhaps a representation of how the Jews felt once the Nazis came into power. Our next stop of interest was Checkpoint Charlie, where a small reconstructed wooden hut represents where the original stood; this was the crossing point where the gateway between East and West Berlin had existed. We were also shown the site of Hitler’s bunker, which now exists as a small car park outside a block of flats, with nothing but an information board informing tourists of its previous purpose. Matt informed us that the little advertising regarding that spot is in order to deter neo-Nazis from having any further Hitler related sites to fuel their political view. The dark history and intimidating feeling of Berlin seemed to grow with the walking tour, as we were also shown the site of the book burning during Hitler’s regime, where a total of over 23,000 books had been destroyed. 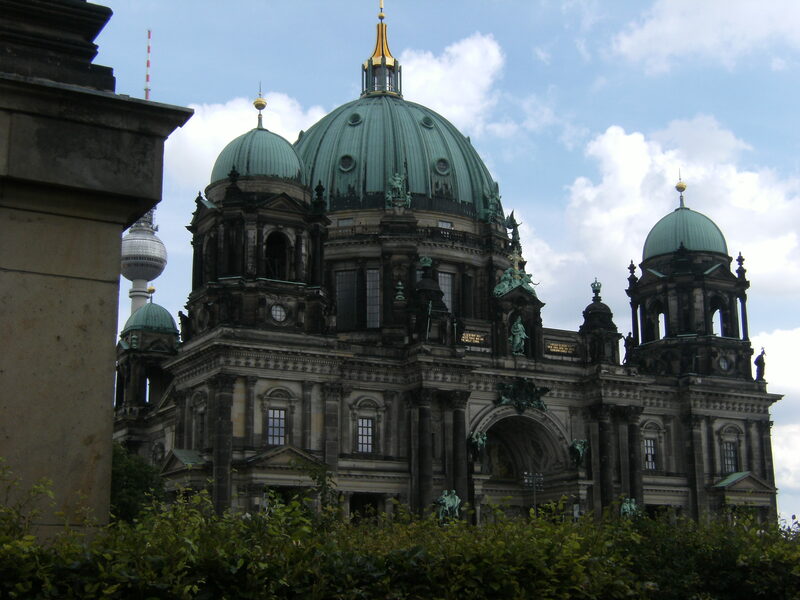 Our final stop was to Museum Island, where an impressively Gothic looking cathedral was in fact only built in the early 1900s. Here we sat as Matt concluded the tour, and the clouds once more started to appear overhead. The four of us made our way to the massively impressive and very extravagantly sized Reichstag building, only to be disappointed to find that the queue was too long for us to be able to gain entry that day. That evening, all of us were feeling slightly uninspired by the city and still rather dejected, so we split into two twos; Hannah and Kat went off on the metro to find somewhere traditionally German to eat, whilst Lexi and I retreated to a small Chinese restaurant where our mood was lifted by rather too much wine and a free shot!